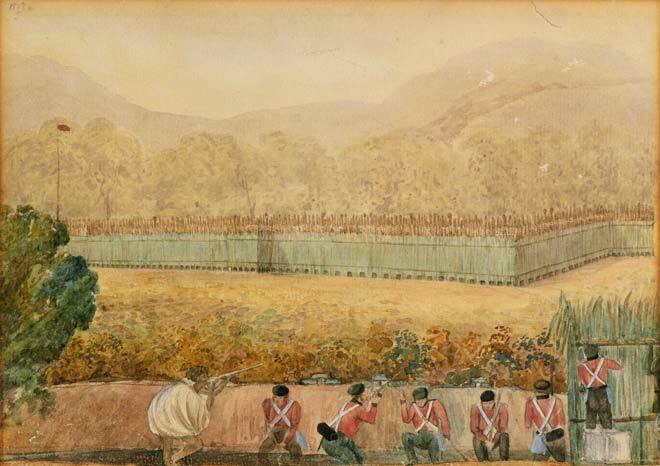 Red-coated British troops and a Māori ally wearing a flax cloak aim from behind flax palisades at Kawiti's pā at Ōhaeawai, Bay of Islands, in July 1845. This was the third major battle of the Northern War which broke out after Kawiti's ally, the Bay of Islands chief Hōne Heke, cut down the flagpole at the British settlement of Kororāreka (Russell) in early 1845. The British later unsuccessfully stormed this pā, suffering heavy casualties. This open warfare contributed to a change of policy towards Māori. Colonial officials such as Governor George Grey began to override the authority of tribal chiefs.